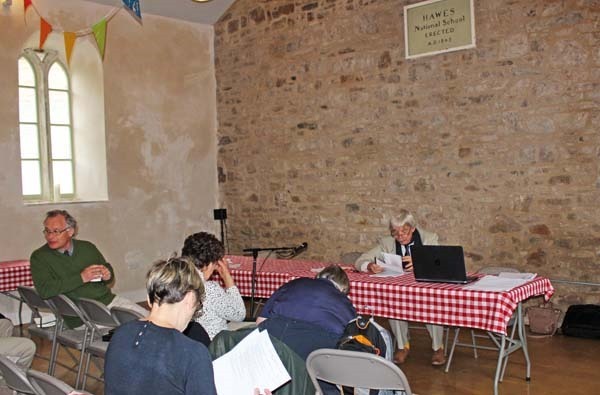 An ARC News Service report on the meeting of the Upper Dales Area Partnership on May 11, 2016 at the refurbished Hawes National School building. The issues discussed included: health projects based at Reeth GP Practice; problems for Aysgarth Surgery; concern about the future of A&E and the maternity unit at the Darlington Memorial Hospital; travel to the James Cook University hospital, including the shuttle bus from Northallerton; bringing superfast broadband to more villages; winter gritting; local schools including Hawes Primary and the sixth form at the Wensleydale School; LEADER grants; and the Richmondshire Rover bus service. The Upper Dales Area Partnership had the honour of being the second group to hold a meeting in the newly refurbished Hawes National School building. Two days previously Hawes and High Abbotside Parish Council met there. Above, Cllr John Blackie preparing for the Area Partnership meeting. North Yorkshire County Councillor John Blackie commented: “This has been lovingly refurbished, sometimes single-handedly by Andrew Fagg and Emily.” He said that the Yorkshire Dales National Park Authority (YDNPA) had ensured that the building had to be initially advertised for community use and this had saved it from becoming a five-bedroom holiday cottage. 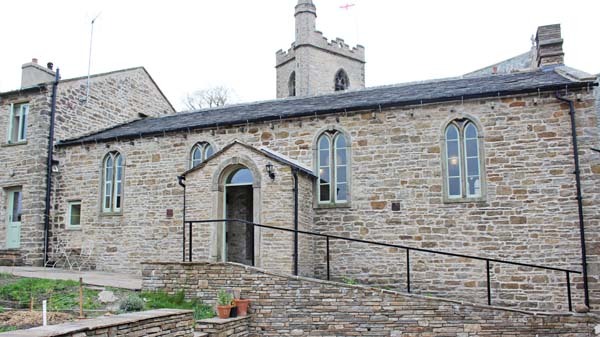 The refurbishment was partly funded by Richmondshire District Council’s Communities Opportunity Fund and the parish council had also given £1,000. “What we have got out of it is a wonderful meeting venue,” Cllr Blackie added. Health projects based at Reeth – Dr Mike Brookes gave an update on the projects based at his GP practice at Reeth. The patient transport project started six months ago and will run for two years. This is a collaboration between the Richmondshire, Hambleton and Whitby Clinical Commissioning Group (CCG), his GP practice and Reeth District Community Transport. It provides a door-to-door service for house-bound patients to the surgery at Reeth so that they can receive treatment without going to hospital. On the way home they can use the transport to do such things as visiting the post office or attending luncheon club meetings. “We’ve had really encouraging initial results,” Dr Brookes said. He added that the service had made it possible for district nurses to take on other jobs such as providing more end-of-life care for patients who wish to remain at home. The pilot transport scheme is also being used to deliver medicines to people who would otherwise struggle to get to the surgery, he said. Cllr Blackie described the transport scheme as a beacon project. Dr Brookes reported that they were working on a community resilience project. “We’ve had our first joint workshop with the Red Cross for emergency care training in the community. The practice was also working with the North Yorkshire Joint Strategic Assessment Board regarding end-of-life care. In this way it would make a contribution to the whole of the county. Defibrillators. – Cllr Blackie commented that almost all the villages in the Upper Dales now had defibrillators. There was concern, however, about how villagers could remain up to date with the skills required to help someone suffering from cardiac arrest. Dr Brookes said the surgery staff were retrained each year in basic life support. He added that Ambulance Control would tell people, step by step, how to use a defibrillator. Jane Ritchie said that parish councils had been reminded that there was a resuscitation dummy at West Burton which could be used for re-training. She reported that the defibrillator at Preston under Scar had been successfully used. Central Dales Practice. – Cllr Blackie reported that it had now been confirmed in writing that patients from the Central Dales Practice would be admitted to The Friary at Richmond for after-hospital care. “So Aysgarth Surgery is operating in the dark ages then,” commented Cllr Blackie. It was agreed that the Area Partnership should write to NHS England not only to ask for an explanation for the delay but also for a date when this service will be available at Aysgarth Surgery. Darlington Memorial Hospital– There was concern that the A&E and maternity services at the Darlington Memorial Hospital were being reviewed. It was pointed out that when the 24/7 consultant-led maternity and paediatric services at the Friarage in Northallerton were downgraded Dales folk had been been told they could rely on the Darlington Memorial Hospital. District Councillor Richard Blows emphasised that they should be feeding in comments before the consultation stage which, he had been told, should begin in November. There was also concern about the future of the shuttle bus service from the Friarage to the James Cook hospital. Cllr Ritchie said that the CCG would keep its commitment to ensure that transport was provided for those needing to access the maternity and paediatric services at Middlesbrough even though further large financial cuts had to be made. She added that many others were using the shuttle service, including those going to work. Cllr Peacock said that it was difficult both driving to and also parking at the James Cook hospital. And Cllr Blackie commented: “The James Cook is a fabulous hospital – I have nothing but praise for it, but it is a long way away.” He felt that there should be better signage to the James Cook hospital along the Middlesbrough section of the A66. Cllr Blows suggested that more use should be made of webcams so that people did not have to go to the hospitals. Cllr Ritchie wondered if a “Friends of the Dales “ project should be started to buy up-to-date tele-medicine equipment for the surgeries. Superfast broadband – Chloe Lewis reported that more money had been allocated to enable more villages to receive superfast broadband at different times during the next year. These include Keld, Askrigg, Low Row, Castle Bolton, Downholme, Catterick, Newton le Willows, East Witton, Spennithorne and Bellerby. She warned that this would mean more road closures. Cllr Peacock explained that a lot of people in the Dales were running small businesses from their homes. Cllr Blackie thanked Chloe and the others who had worked tirelessly to ensure superfast broadband was available in many dales villages. 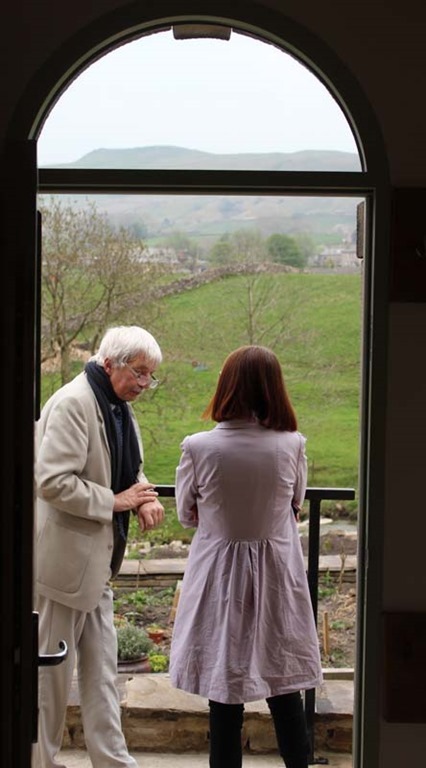 But he pointed out that nothing was being done yet to bring superfast broadband to Arkengarthdale. The Area Partnership agreed to support him in trying to achieve this. Winter gritting. – The Area Partnership also agreed to support Muker Parish Council and Hawes and High Abbotside Parish Council in their request to have the Buttertubs recognised as a Priority One route for winter gritting. Cllr Blackie described this as a lifeline road as the ambulance drivers based at Bainbridge used it to access Swaledale. He explained that although there was a salt pile at Hawes the drivers of the frontline gritters were not allowed to reload there by the contractors. This meant they had to return to Leyburn to reload after having gritted the main roads through Wensleydale, adding one-and-a-half hours to their schedule. If they could reload at Hawes the Buttertubs could become a Priority One route rather than a Priority Two. The only time they can reload at Hawes is when 72 hours of continuous freezing weather was expected, Cllr Blackie said. Local schools. – Cllr Blackie reported that he had met Don Parker, the lead for the multi-academy trust of which Hawes primary school is now a part. The three other schools in the trust are at Harrogate, Skipton and South Craven. He was pleased that the trust was now advertising for a head teacher for Hawes even though, initially, it had stated that it wouldn’t. There was also a guarantee that there would be parent governors. Cllr Peacock was pleased with the way the federation of Bainbridge, Askrigg and West Burton primary schools was developing. She was especially impressed by the new system for teaching Maths that had been introduced by the head teacher. She said that each school was retaining its own identity. The children begin and end each day in their own school, and are taken by bus to Askrigg for any united classes. There was relief that the government had decided not to go ahead with forced Academies especially as it was felt this would lead to the closure of many rural schools. There was concern about the sixth form at the Wensleydale School. Both Cllr Blackie and Cllr Peacock pointed out that students were voting with their feet and going to the Queen Elizabeth school in Darlington. There were now only about 40 students in the sixth form at Leyburn, which was barely enough for two courses to be run each year. Cllr Blackie felt that it was time to consider improving the transport to Darlington especially as the head teacher at the Queen Elizabeth school was willing to organise buses. Cllr Ritchie suggested that over-night accommodation in Darlington should be considered. Grants. – Chloe reported that LEADER grants were available for tourist development, farm diversification and micro and small enterprises. She accepted that it was a complicated process and offered to help anyone with filling in the forms. See http://www.richmondshire.gov.uk/community-and-living/funding-grant-schemes/841-business-funding-scheme for more details about LEADER grants. Chloe’s email address is: chloe.lewis@richmondshire.gov.uk. She can also give advice about other grants which are available. Richmondshire Rover. – Cllr Blackie said that a new bus service – the Richmondshire Rover – had been launched by the Little White Bus to run between Northallerton, Catterick and Richmond four times day. This will continue if enough volunteer drivers can be found. “Self reliance is the name of the game. It is under test,” he said.